Loudspeakers for sound reinforcement systems are designed to project their sound in specific directions. Sound system designers take advantage of the “directivity” characteristics of these loudspeakers, aiming their sound uniformly throughout seating areas, while avoiding walls and ceilings and other surfaces from which undesirable reflections could reduce clarity and fidelity. Many high-quality sound reinforcement loudspeaker systems incorporate horn loudspeakers that provide very good control, but these are relatively large and conspicuous. In recent years, “steerable column arrays” have become available, which are tall but narrow, allowing them to better blend into the architectural design. These are well suited to the frequency range of speech, and to some degree their sound output can be steered up or down using electronic signal processing. 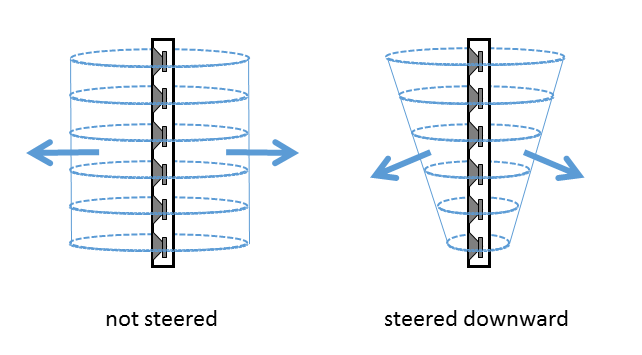 Figure 1 illustrates the steering technique, with six individual loudspeakers in a vertical array. Each loudspeaker generates an ever-expanding sphere of sound (in this figure, simplified to show only the horizontal diameter of each sphere), propagating outward at the speed of sound, which is roughly 1 foot per millisecond. 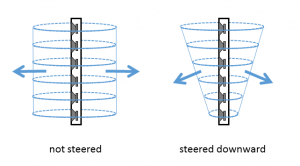 In the “not steered” column, all of the loudspeakers are outputting their sound at the same time, with a combined wavefront spreading horizontally, as an ever-expanding cylinder of sound. In the “steered downward” column, the electronic signal to each successively lower loudspeaker is slightly delayed; the top loudspeaker outputs its sound first, while each lower loudspeaker in turn outputs its sound just a little later, so that the sound energy is generally steered slightly downward. This steering allows for some flexibility in positioning the loudspeaker column. However, these systems only offer some vertical control; left-to-right projection is not well controlled. Steerable column arrays have reasonably resolved speech reinforcement issues in many large, acoustically-problematic spaces. Such arrays were appropriate selections for a large worship space, with a balcony and a huge dome, that had undergone a comprehensive renovation. Unfortunately, in this case, problems with speech intelligibility persisted, even after multiple adjustments by reputable technicians, who had used their instrumentation to identify several sidewall surfaces that appeared to be reflecting sound and causing problematic echoes. They recommended additional sound absorptive treatment that could adversely affect visual aesthetics and negatively impact the popular classical music concerts. Upon visiting the space as requested to investigate potential acoustical treatments, speech was difficult to understand in various areas on the main floor. While playing a click track (imagine a “pop” every 5 seconds) through the sound system, and listening to the results around the main floor, we heard strong echoes emanating from the direction of the surfaces that had been recommended for sound-absorptive treatment. Nearby those surfaces, additional column loudspeakers had been installed to augment coverage of the balcony seating area. These balcony loudspeakers were time-delayed (in accordance with common practice, to accommodate the speed of sound) so that they would not produce their sound until the sound from the main loudspeakers had arrived at the balcony. With proper time delay, listeners on the balcony would hear sound from both main and balcony loudspeakers at approximately the same time, and thereby avoid what would otherwise seem like an echo from the main loudspeakers. With more listening, it became clear that the echo was not due to reflections from the walls at all, but rather from the delayed balcony loudspeakers’ sound inadvertently spraying back to the main seating area. These loudspeakers cannot be steered in a multifaceted manner that would both cover the balcony and avoid the main floor. We simply turned off the balcony loudspeakers, and the echo disappeared. More importantly, speech intelligibility improved significantly throughout the main floor. Intelligibility throughout the balcony remained acceptable, albeit not quite as good as with the balcony loudspeakers operating. The general plan is to remove the balcony loudspeakers and relocate them to the same wall as the main loudspeakers, but steer them to cover the balcony. Adding sound-absorptive treatment on the side walls would not have solved the problem, and would have squandered funds while impacting the visual aesthetics and classical music programming. Listening for solutions proved to be more effective than interpreting test results from sophisticated instrumentation.